Darol, as aficionados of string music know, is a flat-out fiddle guru, unique in his vast range and profound depth, who has spent the past three decades reinventing American string music to encompass his explorations of bluegrass, jazz, and musical traditions from around the world. The groups that he founded or co-founded include the David Grisman Quintet, the Turtle Island String Quartet, Psychograss, Montreux, and the Republic of Strings ensemble. His playing and composition overflow with passion, prodigious technique, and a great sense of humor. He has spent his career enlightening and inspiring his fellow musicians, and vice-versa. That’s where the Furies come in. 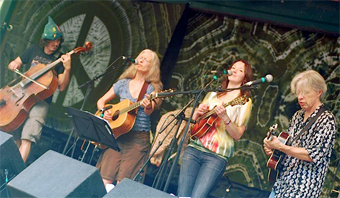 Sharon Gilchrist is a mandolin marvel who has played with Uncle Earl, the Peter Rowan/Tony Rice quartet, and Laurie Lewis and the Right Hands. Emy Phelps is a remarkable vocalist and a star in the Pacific Northwest who put her career on hold to raise four kids and is now back in the game. Tristan Clarridge is a five-time Grand National Fiddle Champion and a pioneering cellist who has toured with Crooked Still. When these four powerful forces get together with Darol, the result is mythical, magical, and musical mayhem.